This is the main map for Croydon and covers the centre of the town, coverage stretching from Wandle Park eastward to Radcliffe Road, and from Derby Road and Oval Road southward to Combe Road. 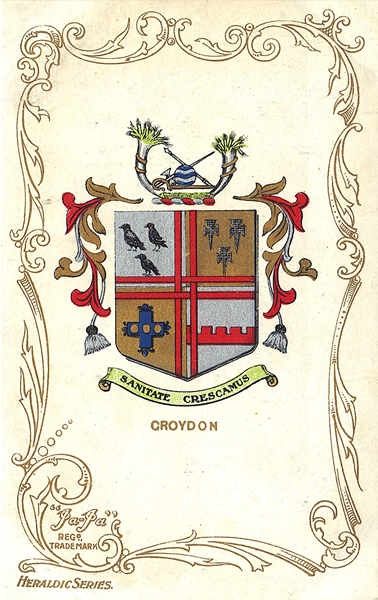 Features include Croydon East station, Town Hall, Coombe Lane station, High Street, Old Town, Duppas House, The Waldrons, Duppas Hill (SW corner), Parkhill House, North End. On the reverse are street directories for Church Road, Church Street, George Street. You might find this Index map useful. The map links up with Surrey Sheet 14.06 West Croydon to the north, 14.09 Beddington to the west, 14.11 Shirley to the east, 14.14 South Croydon to the south.